Your child will be ready to hit the road in this turbo racer costume. It's a jumpsuit of 100% polyester interlock knit, with soft-sculptured fiberfill padding on the chest and shoulders to resemble a well-muscled physique, and a Velcro tab fastener at the back of the neck. The pants of the suit are black with a strip of black and white checkered fabric down each side seam. 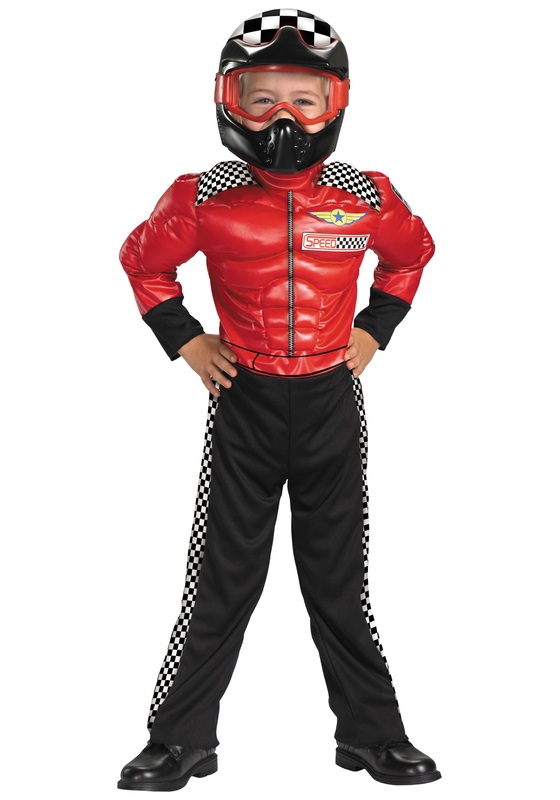 The top is red with printed with a zipper and racing emblems, and has checkerboard patterned epaulets. The molded plastic mask resembles the front of a racing helmet with clear goggles, and is held in place with an elastic band. On your mark! Get set! Go!